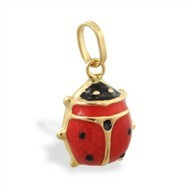 Licensed JewelryThere are 175 products. 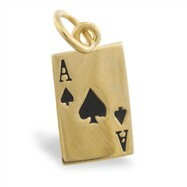 Material: 316L surgical grade stainless steel Width : 1.18"Length : 1.18"
Length: - 1.26" Width: - .31" Width : 0.31"Length : 1.3"
Length: - 1.38" Width: - .83" May 22 - Jun 21. 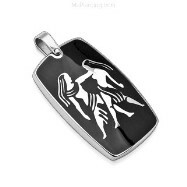 Width : 0.87"Length : 1.42"
Length: 7/16" (11mm) Gauge (Thickness): 14 (1.6mm) Material: 316L surgical grade stainless steel Material: cubic zirconia Material: pewter Type: belly button ring 5mm top ball priced and sold individually Threading Type: Externally Threaded Licensed and Official retailer of Major League Baseball - Atlanta Braves Belly Button Ring. Length: 7/16" (11mm) Gauge (Thickness): 14 (1.6mm) Material: 316L surgical grade stainless steel Material: cubic zirconia Material: pewter Type: belly button ring 5mm top ball priced and sold individually Threading Type: Externally Threaded Licensed and Official retailer of Major League Baseball - Atlanta Braves Bell Button Ring. 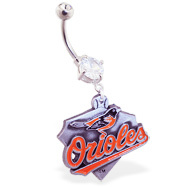 Length: 7/16" (11mm) Gauge (Thickness): 14 (1.6mm) Material: 316L surgical grade stainless steel Material: cubic zirconia Material: pewter Type: belly button ring 5mm top ball priced and sold individually Threading Type: Externally Threaded Licensed and Official retailer of Major League Baseball - Baltimore Orioles Belly Button Ring. 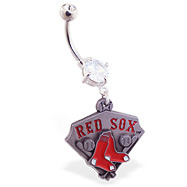 Length: 7/16" (11mm) Gauge (Thickness): 14 (1.6mm) Material: 316L surgical grade stainless steel Material: cubic zirconia Type: belly button ring 5mm top ball priced and sold individually Threading Type: Externally Threaded Licensed and Official retailer of Major League Baseball - Boston Red Sox Bell Button Ring. Length: 7/16" (11mm) Gauge (Thickness): 14 (1.6mm) Material: 316L surgical grade stainless steel Material: cubic zirconia Material: pewter Type: belly button ring 5mm top ball priced and sold individually Threading Type: Externally Threaded Licensed and Official retailer of Major League Baseball - Boston Red Sox Bell Button Ring. Length: 7/16" (11mm) Gauge (Thickness): 14 (1.6mm) Material: 316L surgical grade stainless steel Material: cubic zirconia Material: pewter Type: belly button ring 5mm top ball priced and sold individually Threading Type: Externally Threaded Licensed and Official retailer of Major League Baseball - Chicago White Sox Belly Button Ring. 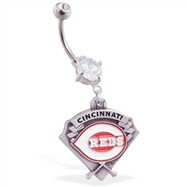 Length: 7/16" (11mm) Gauge (Thickness): 14 (1.6mm) Material: 316L surgical grade stainless steel Material: cubic zirconia Type: belly button ring 5mm top ball priced and sold individually Threading Type: Externally Threaded Licensed and Official retailer of Major League Baseball - Cleveland Indians Bell Button Ring. 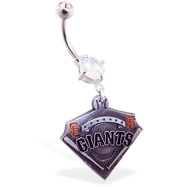 Length: 7/16" (11mm) Gauge (Thickness): 14 (1.6mm) Material: 316L surgical grade stainless steel Material: cubic zirconia Material: pewter Type: belly button ring 5mm top ball priced and sold individually Threading Type: Externally Threaded Licensed and Official retailer of Major League Baseball - Los Angeles Angels Belly Button Ring. 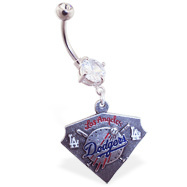 Length: 7/16" (11mm) Gauge (Thickness): 14 (1.6mm) Material: 316L surgical grade stainless steel Material: cubic zirconia Type: belly button ring 5mm top ball priced and sold individually Threading Type: Externally Threaded Licensed and Official retailer of Major League Baseball - Los Angeles Dodgers Belly Button Ring. 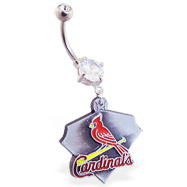 Length: 7/16" (11mm) Gauge (Thickness): 14 (1.6mm) Material: 316L surgical grade stainless steel Material: cubic zirconia Material: pewter Type: belly button ring 5mm top ball priced and sold individually Threading Type: Externally Threaded Licensed and Official retailer of Major League Baseball - Los Angeles Dodgers Bell Button Ring. 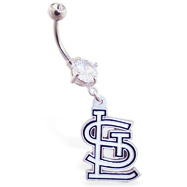 Length: 7/16" (11mm) Gauge (Thickness): 14 (1.6mm) Material: 316L surgical grade stainless steel Material: cubic zirconia Material: pewter Type: belly button ring 5mm top ball priced and sold individually Threading Type: Externally Threaded Licensed and Official retailer of Major League Baseball - Minnesota Twins Belly Button Ring. 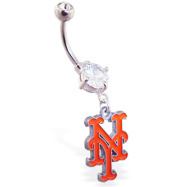 Length: 7/16" (11mm) Gauge (Thickness): 14 (1.6mm) Material: 316L surgical grade stainless steel Material: cubic zirconia Material: pewter Type: belly button ring 5mm top ball priced and sold individually Threading Type: Externally Threaded Licensed and Official retailer of Major League Baseball - New York Mets Belly Button Ring. 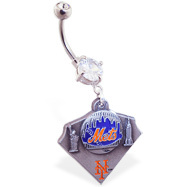 Length: 7/16" (11mm) Gauge (Thickness): 14 (1.6mm) Material: 316L surgical grade stainless steel Material: cubic zirconia Type: belly button ring 5mm top ball priced and sold individually Threading Type: Externally Threaded Licensed and Official retailer of Major League Baseball - New York Metts Bell Button Ring. 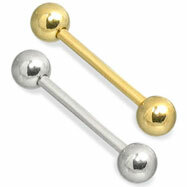 Length: 7/16" (11mm) Gauge (Thickness): 14 (1.6mm) Material: 316L surgical grade stainless steel Material: cubic zirconia Material: pewter Type: belly button ring priced and sold individually 5mm star ball Threading Type: Externally Threaded Licensed and Official retailer of Major League Baseball - New York Yankees Belly Button Ring. 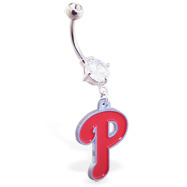 Length: 7/16" (11mm) Gauge (Thickness): 14 (1.6mm) Material: 316L surgical grade stainless steel Material: cubic zirconia Material: pewter Type: belly button ring 5mm top ball priced and sold individually Threading Type: Externally Threaded Licensed and Official retailer of Major League Baseball - Philadelphia Phillies Belly Button Ring. 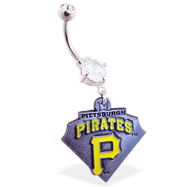 Length: 7/16" (11mm) Gauge (Thickness): 14 (1.6mm) Material: 316L surgical grade stainless steel Material: cubic zirconia Material: pewter Type: belly button ring 5mm top ball priced and sold individually Threading Type: Externally Threaded Licensed and Official retailer of Major League Baseball - Pittsburgh Pirates Belly Button Ring. Length: 7/16" (11mm) Gauge (Thickness): 14 (1.6mm) Material: 316L surgical grade stainless steel Material: cubic zirconia Material: pewter Type: belly button ring 5mm top ball priced and sold individually Licensed and Official retailer of NFL- San Francisco Giants Belly Button Ring. 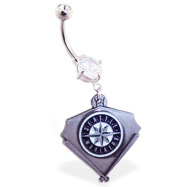 Length: 7/16" (11mm) Gauge (Thickness): 14 (1.6mm) Material: 316L surgical grade stainless steel Material: cubic zirconia Material: pewter Type: belly button ring 5mm top ball priced and sold individually Threading Type: Externally Threaded Licensed and Official retailer of Major League Baseball - Seattle Mariners Bell Button Ring. 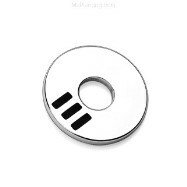 Length: 7/16" (11mm) Gauge (Thickness): 14 (1.6mm) Material: 316L surgical grade stainless steel Material: cubic zirconia Material: pewter Type: belly button ring 5mm top ball priced and sold individually Threading Type: Externally Threaded Licensed and Official retailer of Major League Baseball - St. Louis Cardinals Belly Button Ring. 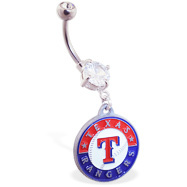 Length: 7/16" (11mm) Gauge (Thickness): 14 (1.6mm) Material: 316L surgical grade stainless steel Material: cubic zirconia Material: pewter Type: belly button ring 5mm top ball priced and sold individually Threading Type: Externally Threaded Licensed and Official retailer of Major League Baseball - Texas Rangers Belly Button Ring. 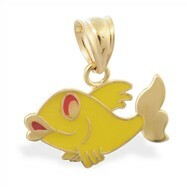 Length: 7/16" (11mm) Gauge (Thickness): 14 (1.6mm) Material: 316L surgical grade stainless steel Material: cubic zirconia Material: pewter Type: belly button ring 5mm top ball priced and sold individually Threading Type: Externally Threaded Licensed and Official retailer of National Collegiate Athletic Association - Auburn University Tigers Belly Button Ring. 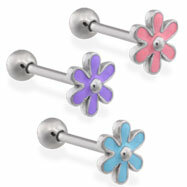 Length: 7/16" (11mm) Gauge (Thickness): 14 (1.6mm) Material: 316L surgical grade stainless steel Material: cubic zirconia Material: pewter Type: belly button ring 5mm top ball priced and sold individually Threading Type: Externally Threaded Licensed and Official retailer of National Collegiate Athletic Association - Louisiana State University Tigers Belly Button Ring. 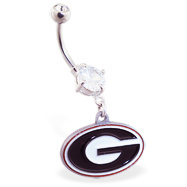 Length: 7/16" (11mm) Gauge (Thickness): 14 (1.6mm) Material: 316L surgical grade stainless steel Material: cubic zirconia Material: pewter Type: belly button ring 5mm top ball priced and sold individually Threading Type: Externally Threaded Licensed and Official retailer of NCAA - Ohio State Buckeyes Belly Button Ring. 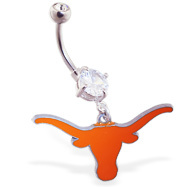 Length: 7/16" (11mm) Gauge (Thickness): 14 (1.6mm) Material: 316L surgical grade stainless steel Material: cubic zirconia Material: pewter Type: belly button ring 5mm top ball priced and sold individually Threading Type: Externally Threaded Licensed and Official retailer of NCAA - Oklahoma University Sooners Belly Button Ring. 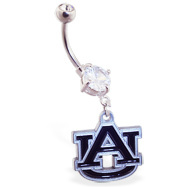 Length: 7/16" (11mm) Gauge (Thickness): 14 (1.6mm) Material: 316L surgical grade stainless steel Material: cubic zirconia Type: belly button ring 5mm top ball priced and sold individually Threading Type: Externally Threaded Licensed and Official retailer of National Collegiate Athletic Association - Oregon State Beavers Belly Button Ring. 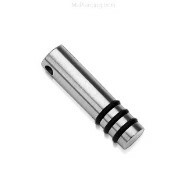 Length: 7/16" (11mm) Gauge (Thickness): 14 (1.6mm) Material: 316L surgical grade stainless steel Material: cubic zirconia Material: pewter Type: belly button ring 5mm top ball priced and sold individually Threading Type: Externally Threaded Licensed and Official retailer of NCAA - Penn State Nittany Lions Belly Button Ring. 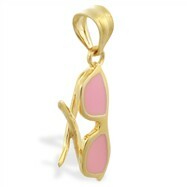 Length: 7/16" (11mm) Gauge (Thickness): 14 (1.6mm) Material: 316L surgical grade stainless steel Material: cubic zirconia Material: pewter Type: belly button ring 5mm top ball priced and sold individually Threading Type: Externally Threaded Licensed and Official retailer of National Collegiate Athletic Association -University of Georgia Bulldogs Belly Button Ring. 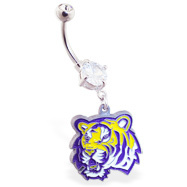 Length: 7/16" (11mm) Gauge (Thickness): 14 (1.6mm) Material: 316L surgical grade stainless steel Material: cubic zirconia Material: pewter Type: belly button ring 5mm top ball priced and sold individually Threading Type: Externally Threaded Licensed and Official retailer of NCAA - University of Nebraska Cornhuskers Belly Button Ring. 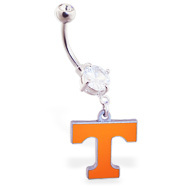 Length: 7/16" (11mm) Gauge (Thickness): 14 (1.6mm) Material: 316L surgical grade stainless steel Material: cubic zirconia Material: pewter Type: belly button ring priced and sold individually Threading Type: Externally Threaded Licensed and Official retailer of National Collegiate Athletic Association - University of Tennessee Volunteers Belly Button Ring. 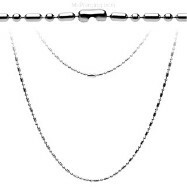 Length: 7/16" (11mm) Gauge (Thickness): 14 (1.6mm) Material: 316L surgical grade stainless steel Material: cubic zirconia Material: pewter Type: belly button ring 5mm top ball priced and sold individually Threading Type: Externally Threaded Licensed and Official retailer of National Collegiate Athletic Association - University of Texas Longhorns Belly Button Ring. 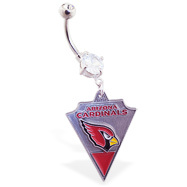 Length: 7/16" (11mm) Gauge (Thickness): 14 (1.6mm) Material: 316L surgical grade stainless steel Material: cubic zirconia Material: pewter Type: belly button ring 5mm top ball priced and sold individually Threading Type: Externally Threaded Licensed and Official retailer of NFL- Arizona Cardinals Belly Button Ring. 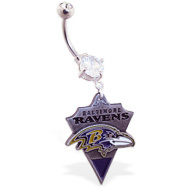 Length: 7/16" (11mm) Gauge (Thickness): 14 (1.6mm) Type: belly button ring 5mm top ball priced and sold individually Threading Type: Externally Threaded Licensed and Official retailer of NFL football - Atlanta Falcons Bell Button Ring. 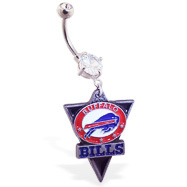 Length: 7/16" (11mm) Gauge (Thickness): 14 (1.6mm) Material: 316L surgical grade stainless steel Material: cubic zirconia Material: pewter Type: belly button ring 5mm top ball priced and sold individually Threading Type: Externally Threaded Licensed and Official retailer of NFL- Buffalo BillsBelly Button Ring. 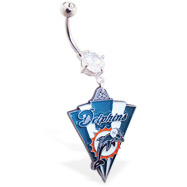 Length: 7/16" (11mm) Gauge (Thickness): 14 (1.6mm) Material: 316L surgical grade stainless steel Material: cubic zirconia Material: pewter Type: belly button ring 5mm top ball priced and sold individually Licensed and Official retailer of NFL- Carolina Panthers Belly Button Ring. 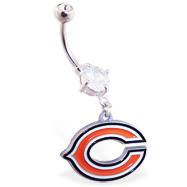 Length: 7/16" (11mm) Gauge (Thickness): 14 (1.6mm) Material: 316L surgical grade stainless steel Material: cubic zirconia Material: pewter Type: belly button ring 5mm top ball priced and sold individually Threading Type: Externally Threaded Licensed and Official retailer of NFL- Chicago Bears Belly Button Ring. 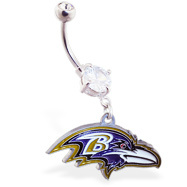 Length: 7/16" (11mm) Gauge (Thickness): 14 (1.6mm) Material: 316L surgical grade stainless steel Material: cubic zirconia Material: pewter Type: belly button ring 5mm top ball priced and sold individually Threading Type: Externally Threaded Licensed and Official retailer of NFL- Cincinnati Bengals Belly Button Ring. 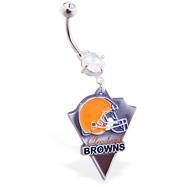 Length: 7/16" (11mm) Gauge (Thickness): 14 (1.6mm) Material: 316L surgical grade stainless steel Material: cubic zirconia Material: pewter Type: belly button ring 5mm top ball priced and sold individually Threading Type: Externally Threaded Licensed and Official retailer of NFL- Cleveland Browns Belly Button Ring. 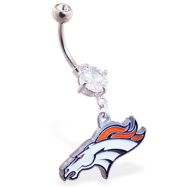 Length: 7/16" (11mm) Gauge (Thickness): 14 (1.6mm) Material: 316L surgical grade stainless steel Material: cubic zirconia Material: pewter Type: belly button ring 5mm top ball priced and sold individually Threading Type: Externally Threaded Licensed and Official retailer of NFL- Denver Broncos Belly Button Ring.